cultural cognition project - Cultural Cognition Blog - Do conservatives become more concerned with climate risks as their trust in science increases? It is almost universally assumed that political polarization over societal risks like climate change originate in different levels of trust in scientists: left-leaning people believe in human-caused climate change, it is said, because they have a greater degree of confidence in scientists; so-called “conservative Republicans," in contrast, are said distrust of science and scientists and thus are predisposed to climate skepticism. But is this right? Or are we looking at another form of the dreaded WEKS disease? Well, here’s a simple test based on GSS data. These items formed a single factor and had a Cronbach’s α score of 0.72. Not bad. I also reverse coded as necessary so that for every item a higher score would denote more rather than less trust of science. I don’t love this item but it is a cousin of the revered Industrial Strength Risk Perception Measure, so I decided I’d give it a whirl. I then did some regressions (after of course, eyeballing the raw data). If one stops there, the result is an affirmation of the common wisdom. Both political outlooks and trust in science have the signs one would expect, and if one were to add their coefficients, one could make claims about how much more likely relatively conservative respondents would be to see greater risk if only they could be made to trust science more. But this form of analysis is incomplete. In particular, it assumes that the contribution trust in science and left_right make to perceptions of the danger of climate change are (once their covariance is partialed out) independent and linear and hence additive. But why assume that trust in science has the same effect regardless of respondents’ ideologies? After all, we know that science comprehension’s impact on perceived climate-change risks varies in relation to ideology, magnifying polarization. Shouldn’t we at least check to see if there is a comparable interaction between political outlooks and trust? So I created a cross-product interaction term and added it to form another regression model. And sure enough, there was an interaction, one predicting in particular that we ought to expect even more partisan polarization as right- and left-leaning individuals' scores on the trust-in-science scale increased. Geez! Higher trust promotes greater risk concern for left-leaning respondents but has essentially no effect whatsoever on right-leaning ones. Well one possibility that occurs to me is based on biased perceptions of scientific consensus. Experimental data suggest that ordinary persons of diverse outlooks are more likely to notice, assign significance to, and recall instances in which a scientist took the position consistent with their cultural group's than ones in which a scientist took the opposing position. As a result, people end up with mental inventories of expert opinion skewed toward the position that predominates in their group. If that's how they perceive the weight of expert opinion, why would they distrust scientists? But I dunno. This is just post hoc speculation. Tell me what you think the answer is – and better still, how one could design an experiment to test your favored conjecture against whatever you think the second most likely answer is. As a regular reader of your blog, I knew the answer to the question in the title before reading the post or looking at the graph. I wonder if the other 7 Billion readers did too? Seems rather obvious, to me. It seems to me that it should always be important for you to analyze these data by using a continuous variable to quantify identity orientation: In other words, how can we understand the effects your describing if you don't differentiate between Tea Partiers and mainstream Pubz, For example. it does seem like there are some data that show that mainstream Pubz are more like Independents and maybe even mainstream Demz than they are like Tea Partiers when it comes to beliefs about climate change. The following link isn't working in the above post. Which statement do you think most accurately describes how the scientific consensus on [various issues] has been formed : A. liberal scientists dominate, B. conservative scientists dominate , C neither liberals or conservatives dominate. Where the [various issues] is replaced with items such as climate change, public health policy to address issues like infectious disease like Ebola, potential dangers of GMO, gun safety, the impact of gun control, the effectiveness of stop-and-frisk policies, etc. Both predictors -- left_right & sci_trust-- are continuous. No problem. And your point about tea party members remains valid: if they are different, it is the continuous measure that will hide that inform,ation from us. The thing to do would be to add a variable for membership in tea party & then an appropriate interaction term shows that they respond differently from others who share their left_right score. Unfortuantely, there is no tea-party variable in the GSS. "Geez! Higher trust promotes greater risk concern for left-leaning respondents but has essentially no effect whatsoever on right-leaning ones. [...] Tell me what you think the answer is – and better still, how one could design an experiment to test your favored conjecture against whatever you think the second most likely answer is." 1. Left-leaners base their beliefs about climate change on trusting what experts say, Right-leaners base them on what they know of the empirical evidence. 2. People of both political inclinations tend to accept weak evidence (like argument from authority) when the claims conform to their prior beliefs, but to seek out stronger confirmation (like asking about the empirical evidence) when the claims are surprising or contradict what they know. In the case of climate science, looking for confirmation reveals lots of holes. 3. Left-leaners believe climate scientists are typical of scientists generally. Right-leaners trust scientists generally but think climate scientists are an exceptional minority corrupted by politics. 4. Left leaners are thinking of the 88% "mainstream" climate scientists when you ask whether they trust "scientists". Right-leaners are thinking of the 12% 'dissident' climate scientists as the "scientists" they trust. 6. Left-leaners impression of what mainstream climate scientists say is based on the alarmist media end-of-the-world hype. Right-leaners have heard from separate sources left-wingers don't read that even mainstream climate scientists say the evidence is weak and the predictions uncertain in their technical work, and their calls for action are on a precautionary, "just in case" basis, rather than any confident knowledge of imminent doom. They agree with most climate scientists too, but it's the media and politicians (and a handful of political activist 'bad apple' scientists) that are distorting the scientists' message. 7. Subjects are trying to manipulate the results the surveyors will report for political impact - as they know such surveys are commonly used as input into political debates and policy decisions. For left-leaners, trust in science aligns with their political aspirations on climate change action, and the most aspiring want to promote the idea of the population trusting the authoritative climate scientists message. For right-leaners, the impression they want to convey is of a scientifically literate and science-respecting population rejecting unscientific, politically-motivated climate science alarmism. 8. Right-leaning climate sceptics are sensitive to the political accusation that they're "anti-science", and therefore claim to be more pro-science than they actually are. 9. There is a large and culturally influential political group with a specific cluster of identifying beliefs: militant atheist, pro-science, anti-"woo", high-spending big-government, environmentally concerned, authority-trusting, left leaning... They claim to trust science particularly strongly because that is one of the identifying indicators of their in-group membership. Likewise for climate change concern. There is no corresponding cultural group on the right, or if there is it's a lot smaller. How can we devise an experiment to test these? I'd start off by simply *asking* the survey subjects why they answered the questions as they did, why they believe what they do. Even better, do interviews so you can ask for clarification, and be sure you really understand what they mean by their answer, and what they think you meant by your question, and whether there are any nuances or context that could mislead. Then use that to design better questions for a broader survey with a larger sample size. Trying to figure out a complex situation like this using nothing but multiple-choice survey questions is like trying to figure out what's in a room full of clutter by peering through the keyhole! My thinking is that Tea Partiers are at the far right end of the contiuum - as evidenced by their views on climate change. To benefit from information provided by others, people must be somewhat credulous. However, credulity entails risks. The optimal level of credulity depends on the relative costs of believing misinformation versus failing to attend to accurate information. When information concerns hazards, erroneous incredulity is often more costly than erroneous credulity, as disregarding accurate warnings is more harmful than adopting unnecessary precautions. Because no equivalent asymmetry characterizes information concerning benefits, people should generally be more credulous of hazard information than of benefit information. This adaptive negatively-biased credulity is linked to negativity bias in general, and is more prominent among those who believe the world to be dangerous. Because both threat sensitivity and dangerous-world beliefs differ between conservatives and liberals, we predicted that conservatism would positively correlate with negatively-biased credulity. Two online studies of Americans support this prediction, potentially illuminating the impact of politicians’ alarmist claims on different portions of the electorate. "My thinking is that Tea Partiers are at the far right end of the contiuum - as evidenced by their views on climate change." I've heard it suggested that Tea Partiers have a large libertarian contingent, which would put them closer to a different corner of the Nolan chart entirely. "When information concerns hazards, erroneous incredulity is often more costly than erroneous credulity, as disregarding accurate warnings is more harmful than adopting unnecessary precautions." That depends on the precautions being proposed, and the frequency with which true and false warnings are made. If someone proposes amputation just in case that brown mark on your skin is skin cancer, the cost of taking unnecessary precautions is high. And if 99.9% of all warnings turn out to be false alarms (and so far, "end of the world" warnings have a 100% record on this), then even a small precautionary cost-per-warning soon adds up. I think whoever wrote that wasn't thinking of the actual chain of logic involved; they were thinking instead of the conclusion they wanted to support. However, it's easy enough to use this logic to support the opposite conclusion. We just give lots of warnings of the dire economic impact on jobs and prosperity and third-world economic development of restricting industry with unnecessary regulations. If, as stated, credulity of hazard warnings is always preferable, then this ought to apply equally when the hazards are about economic damage as well. The flaw in the logic is obvious when used to support a policy you don't agree with, but completely invisible used in support of one you do. Interesting. On the contrary, I'm willing to bet the left-leaning group is less, not more, likely to know that black carbon and coal ash are NOT the same as CO2. The first 2 are pollutants, CO2 is not (its optical qualities notwithstanding). The phrasing of the question is so vague it's like Hilbert's hotel - it's full, but an infinite number of new guests can be accommodated. One person who might know how to design a test is David Gelernter. @NiV-- when I've looked at data, those who identify w/ tea party are just a mishmash of conservatives. Definitely not libertarian in any distinctive way. "On the contrary, I'm willing to bet the left-leaning group is less, not more, likely to know that black carbon and coal ash are NOT the same as CO2." Understanding science and supporting science are not the same thing. Do Republicans think climate science should get more funding? Yes or no? Whether they understand the difference between diamonds and charcoal is not the issue. "@NiV-- when I've looked at data, those who identify w/ tea party are just a mishmash of conservatives. Definitely not libertarian in any distinctive way." Yes, I remember discussing it, now. Someone did a survey. 39% of libertarians identify with the Tea Party. 26% of the Tea Party say they are libertarians (while 52% said they were from the "religious right"). You responded by wondering whether self-identication as either has really been found to be a reliable measure of anything! I guess that goes for all surveys. Although I'm wondering now what that implies for identity-protective cognition. This statement is "not even wrong". Would such a question even be admissible in a court of law? I must defer to your legal expertise but isn't the implicit assumption that the "rise in global temperature" is CAUSED by the "greenhouse effect" a prima faciae case of leading the witness? Then consider the definite article stuck in front of both phrases - it's a logical fallacy known as "the golden mountain does not exist" in Principia. Further, and before getting to causality, the "rise" is under a single degree Centigrade over a couple of centuries, the measurement errors exceed that margin, and by far the main component of those greenhouse gases is as you know water vapor. We have reasonably good records of both temperatures and CO2 going back more than 3 million years - which is about when glaciations started - and whatever caused the five interglacials since then it can't have been us. Now even a blind man standing outdoors on a sunny day knows when a cumulus (fluffy low altitude) cloud is overhead because the temperature drops - cirrus clouds (wispy high altitude) do not affect ground temperature. And the main problem with all those UN models and related AlGorisms is that, not knowing how cloud cover works (an elementary problem in fluid dynamics) they postulate clouds, their type, and their altitude. That is mathematically laughable - that's exactly where Hilbert hotels come in, defining both the terms and the operations that can be conducted with them is essential. You are in good company - with Poincaré - but Hilbert was right on infinities calculus. As to the more sophisticated economic global warming models - Nordhaus's is the best - they measure CO2 as a proxy for terrible pollutants (black carbon, coal ash, heavy metals, incl. radioactive, etc), when it is not. Finally, you mention risk proxies, and perhaps that is the best approach here - why limit cultural cognition to scientific matters and not examine the resolution of uncertainty over time? Diet advice - experts peddling partially hydrogenated oils for decades - or that notorious intel community arriving at a "consensus" about Saddam's WMDs, or any number of other propaganda memes promoted in the past. Until Al Gore and the shameless UN "model" promoted by China and India to shake down Western nations (while naturally excluding themselves from those controls on CO2) "climate scientists" were weathermen - not expected to calculate workarounds for Navier-Stokes for prediction purposes. Did you know the Kyoto protocol strongly recommended replacing gasoline car engines with diesel because it produces less CO2? The Japanese were clearly smarter than the Europeans on that one. Interesting choice of links. So can I deduce that when you say "My thinking is that Tea Partiers are at the far right end of the contiuum - as evidenced by their views on climate change." the continuum you're talking about is the climate scepticism spectrum? 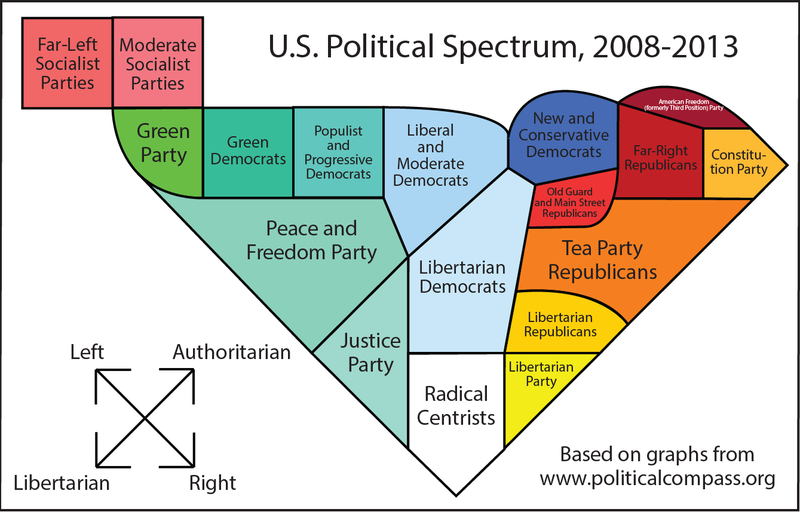 For some reason, I thought you meant the political spectrum. "Would such a question even be admissible in a court of law?" The primary scientific problem with the question is that without the greenhouse effect the average temperature of the Earth would be about -21 C! Therefore, from a scientific point of view, the greenhouse effect per se is *not* a threat to the environment - to the contrary, it's the only thing that makes the environment livable. From a scientific point of view it's a stupid question, obviously asked by somebody with no understanding of the science. But of course we all know that such questions are not to be taken literally, but are code for commonly known, culturally and politically defined positions that the surveyors and their subjects all assume - (although they sometimes make different assumptions, having different cultural contexts, thus rendering the results meaningless). For the purposes of interpreting these results, there is *no point* discussing the technicalities of the physics/chemistry or of scientific truth. Most of the public being surveyed (of both parties) don't understand the science. The people asking the survey questions don't understand the science - or in many cases, even the terms of the debate. Dan here doesn't know how the greenhouse effect works; he's certainly not based his belief in its dire consequences on his scientific understanding of the physics. It's all about politics and memes and how the media, government, and educational system for opinion in society, about who trusts who to tell them what opinion to have and what arguments to use, about authority and trust, and accepting arguments from authority. Actual climate science has zero to do with it - it's all about the sociology of political opinion-forming in society. The question is simple: should the scientifically ignorant public trust whatever scientists tell them to believe about politically-relevant scientific topics? A large part of the 'science of science communication' is built on the moral assumption that they should, and is busily researching ways to bring that about. How can they present their arguments and claims so that the public will believe them? Whether they're scientifically true or not is irrelevant to that. And so arguing that they're not true has no impact on the discussion. That's not what it's about. "Until Al Gore and the..."
"NiV - it was a "no" :)"
Right. And that's how Dems interpret a statement like "Republicans are anti-science." They've been using it as an insult/accusation for a few years now. So if you're doing a survey, and the surveyor says "Hmm. You're a Republican, eh? Do you support science? ", what are you going to say? You know that the results of this survey are going to get used as ammunition in the culture war, and knowing that Republican support/opposition for science is one front in that war - are you going to make it worse by telling them you don't support or believe in the public benefits of science? No, of course not. And so such questions are not actually measuring people's real trust in science - they're just measuring whether they're a Republican who doesn't enjoy being labeled "anti-science", and that probably applies independently of how they happen to interpret the 'greenhouse' question. I expect most Republicans *are* genuinely supportive of science that hasn't been corrupted by progressive political ambitions (as in hypothesis 3), but you wouldn't be able to tell from an opinion survey because they're all warped by their widespread use as political ammunition. Dan makes this same argument on the evolution question :- asking people whether they believe in evolution doesn't measure their understanding of or trust in science, with which it is uncorrelated - it simply measures their religion. So hypothesis 8 is that the result is meaningless because the questions are not measuring what they claim to be measuring. When particular beliefs and positions become entangled in the culture war, and surveys about them are used dishonestly, survey subjects manipulate their answers to counter that dishonesty as much as they can. Survey's no longer converge on the truth about people, but on the cultural stances they wish (or are forced) to project. I'm not saying it's true. I don't have any data to say how widespread such reasoning might be. It's just one of an infinity of vaguely plausible alternative hypotheses Dan needs to consider. All I was trying to do was make the point that there are *lots* of possibilities - far too many to address with a simple change of wording or question order. Dan needs to stop and *ask* a sample of people why they believe what they do, and understand their positions and influences, to generate the right questions to ask. Because at the moment we're stumbling around in the dark. We don't know if ordinary people (the vast majority who are not involved in the climate debate) are interpreting the highly ambiguous and badly worded questions the same way as each other, or the same way they were intended by the questioner. We don't know that they're being answered honestly. We're still peering through the keyhole and trying to guess, instead of just opening the door and going in for a poke around. I agree the GSS item presupposes belief that the temperature of earth is increasing & that's not desirable. In general, though, I view attitudinal items as measuring some unobserved disposition. B/c of "affect heuristic," people tend to uniformly pick "yay" or "boo" responses, depending on their predispositions, to all items that they can understand as relating to the putative risk source. That's the theory behind the Industrial Strength Risk Perception Measure. It's an efficient 1-item measure; there'd be less noise if there were additional items to scale it witih, but it isn't biased. Charitably, the GSS question can be understood as having those characteristics. The bimodal distribuiton is consistent with that interpretation. Finally, I don't think it matters much how a court of law would regard this question. Courts have their own goals, which may or may not be same as those of public opinion analyst. In addition, rules of evidence and procedure don't reliably conduce to truth-seeking. Dan - that rules of evidence are not conducive to truth-seeking becomes evident when you consider they change by jurisdiction. Here is Pascal: "Plaisante justice qu’une rivière borne! Vérité au-deçà des Pyrénées, erreur au-delà." But there is something absolutely IRRESISTIBLE about the TRUTH. Consider - I promised to speak at a memorial service later today. The organizer who called me, in answer to my question "why me - I've never served in the armed services" said bluntly "we couldn't find a woman who did, and you look good on pictures!" Couldn't turn that one down, so then I asked if reciting a poem was acceptable, he said sure, and now I'm memorizing "Half a league, half a league / Half a league onward". I wonder if the percentage of people in the church who heard of the Crimean war is greater than the percentage who have heard of black carbon - if I find out will post here. Seems to me that this regression of TEMPGEN on the single "trust in science" factor exposes an important link in the form of the respondents' environmental worldviews. What does it mean for something to be dangerous to the environment at all? We don't really have a control here that assesses, for example, how much left-leaning and right-leaning people "believe" radioactive materials to be dangerous to the environment. Absent a control like that, I don't think we can use these data to say anything about how trust in science is influencing peoples climate change/global warming risk assessments in particular. In my experience, left-leaners in America assess high risk -because the environmental perils are inherently dangerous-, but right-leaners assess low risk -because they have confidence that humans will handle the challenges properly- despite or due to that very same inherent danger. Left-leaner, in worried tone: "We've got to do something about how X is affecting the environment." Right-leaner, non-chalant: "Of course we'll do something to deal with how X is affecting the environment." Note the difference in their emotional affect towards the issue, while not being in actual disagreement on any position or issue. what would you predict if there were a nuclear power outcome variable? Or what inferences would you draw from the different possibilities that we might observe? "......ounce for ounce, coal ash released from a power plant delivers more radiation than nuclear waste shielded via water or dry cask storage......."
> not to mention the incomprehensible belief that hydroelectric dams, trapping vast quantities of vegetation, aren't a massive source of CH4, I have concluded that communicating scientific data to ANYBODY, including our distinguished host here, is beyond my capabilities. Gelernter highlights the role of American Jews as "carbon 14," a way to trace the enormous cultural change and its consequences in higher education. Up through the 60s, the WASP establishment excluded Jews from elite universities. But by 1970, Jews had pushed their way into student bodies, faculties, and administrations. The consequences? Again, easy. Jews are both leftist and aggressive. "Naturally, we would expect that an increasing Jewish presence at top colleges" would imprint the schools with those qualities. "And this is just what happened." Colleges and universities became more leftist as well as more "thrusting" and "belligerent." Indeed, who would be better as a science advisor in the Trump administration? As an aggressive leftist Jew who has worked at elite universities, I can't think if any better ways to mitigate the destructive societal impact of that "thrusting" and "belligerent" cohort. In response to an earlier comment by Joshua above regarding taking the Tea Party into account. I would like to reiterate my interest in using something other than an x-y scale from Liberal/Democrat to Conservative/Republican. In my opinion, much of the nuance as to who believes what and why are likely lost because these smaller cultural affiliations are not taken into account. I moved a response to Ecoute Savage's quote on nuclear power to the next post. Despite my earlier comment, I do agree with that. IMO, cultural affiliations are more just orientations in themselves, and trying to impose a taxonomy on the associated beliefs is inherently problematic - certainly a taxonomy along a single axis. Consider, for example, how conz and libz can reverse their beliefs on various issues in ways that are ideologically contradictory - seemingly out of a drive to be not someone else. Or consider the need to account for the Trump axis if you will, which could help to explain the anti-anti Trumpers. "NiV - your last post here struck me as somewhat pessimistic (surely nobody is suggesting bad faith on the part of Dan Kahan, personally),"
Definitely not. But we briefly discussed the technicalities of climate science in the early days and Dan (IIRC) said that part of it wasn't his research interest, and to some degree it didn't make any difference to the scientific interest in his results. It should be as interesting and surprising to a climate sceptic that liberals believe more in global warming the more science literate they are, as it is to a climate change believer that conservatives disbelieve more the more scientifically literate they are. *Whoever* is right about the climate, it's still a sign there's something more in play than simple ignorance/knowledge about the science, and so trying to fill in that ignorance is unlikely to work. Even though I'm a climate sceptic and Dan isn't, I stil find Dan's research interesting, and Dan for his part has been very tolerant and open to my comments on his work. This is how science *ought* to happen - a friendly debate between people supporting different positions. But Dan's always been clear that he believes in climate change danger because he trusts consensus scientists, not because he knows any climate science, and I don't have a problem with that. Freedom of Belief requires that we can all believe as we choose, for whatever reasons we choose, even things that are untrue. It's necessary that Dan has the freedom to believe, so that I can have the freedom to disbelieve.